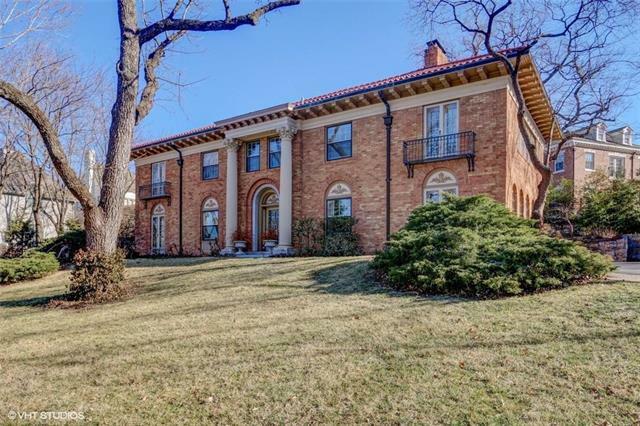 Beautiful Colonial with Red Tile roof overlooking the Plaza on one of KC's most desirable streets. The Architectural integrity is conveyed in all the details including the Leaded Stain Glass Windows, Barrel Archways, and Fireplace detailing. The Eat-In Kitchen has quality features and amenities. The large Master Bedroom has a fireplace, huge closet and dressing area. Attention to detail extends to the grounds on a .8 acre lot wit Brick Patio and Terracing. An additional 2 car detached garage was added in 2007. Directions: Approximately 3 houses from 55th Street.